Kenneth Thomas “Ken” Cuccinelli II born July 30, 1968) is the current Attorney General of Virginia and the Republican candidate for Governor of Virginia in the 2013 Virginia gubernatorial election. He was elected as Virginia’s 46th Attorney General in the November 2009 general election. From 2002 until January 16, 2010 he was a Republican member of the Senate of Virginia, representing the 37th district in Fairfax County. He holds degrees in engineering, law and commercial policy, and co-founded a small law firm. 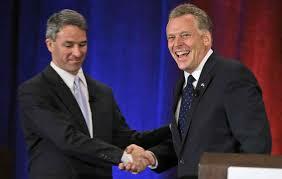 On May 18, 2013, Cuccinelli won the Republican Party’s gubernatorial nomination at the state party convention. He is running against Democrat Terry McAuliffe and Libertarian candidate Robert Sarvis in the election. Cuccinelli was born in Edison, New Jersey, the son of Maribeth (néeuccinelli was born in Edison, New Jersey, the son of Maribeth (née Reilly) and Kenneth Thomas Cuccinelli. His father is of Italian descent and his mother is of Irish ancestry. He graduated from Gonzaga College High School and received his B.S. in Mechanical Engineering from the University of Virginia, a J.D. degree from George Mason University School of Law, and an M.A. in International Commerce and Policy from George Mason University. Terence Richard “Terry” McAuliffe born February 9, 1957) is an American businessman, fundraiser, politician, and former chairman of the Democratic Party. He served as chairman of the Democratic National Committee from 2001 to 2005 and served as co-chairman of President Bill Clinton‘s 1996 re-election campaign and as chairman of Hillary Clinton‘s 2008 presidential campaign. He was an unsuccessful candidate for the Democratic nomination in the 2009 Virginia gubernatorial election and is the Democratic nominee in the2013 Virginia gubernatorial election, running against Republican candidate Ken Cuccinelli and Libertarian candidate Robert Sarvis in the election. McAuliffe grew up in Syracuse, New York, and graduated from Bishop Ludden Junior/Senior High School in 1975.he received a bachelor’s degree from The Catholic University of America in Washington, D.C. After graduation, McAuliffe took a job in the 1980 presidential reelection campaign of Jimmy Carter, and at the age of 22 became the national finance director. After the campaign, McAuliffe enrolled in law school at Georgetown University Law Center.